Chelsea breezed into the final of the Asia Trophy with a comfortable 4-0 win over Kitchee at Hong Kong Stadium on Wednesday. 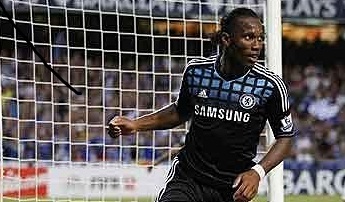 Andre Villas-Boas opted for Drogba as the focal point of a three-pronged attack with Salomon Kalou and Florent Malouda either side, leaving Fernando Torres on the bench, and it was Kalou who almost put Chelsea in front after 16 minutes but his powerful downward header from Drogba's right-wing cross bounced up and hit the bar. Chelsea continued to dominate, with Kitchee reduced to sporadic counter-attacks, but they could not convert their superiority over their enthusiastic opponents into something more substantial until the 36th minute. Yossi Benayoun beat a couple of defenders in the box before the midfielder was crudely hacked down and Lampard drilled the resultant penalty low down the middle. Drogba saw a 30-yard free-kick punched away by Wang Zhenpeng before a ball over the top in first-half injury time set Malouda free and he rounded the Kitchee keeper but his shot from a tight angle was blocked on the line. Drogba grazed the top of the net with another free-kick four minutes into the second half before Luzardo sliced Malouda's low cross into his own net to make it 2-0. Chelsea netted their third on the hour when Drogba bravely met Malouda's deflected cross to head home from close range and was replaced by Torres immediately afterwards. Fellow substitute John Obi Mikel nodded Benayoun's cross wide and Sturridge curled a free-kick just over as Chelsea threatened a fourth goal. It was Sturridge who claimed it with a fine individual effort in the 78th minute as he picked up the ball on the right side of the box, beat two men and finished from a tight angle. Torres was unlucky to see a 25-yard strike smack the base of the post on the stroke of full-time as Chelsea eased to victory and they now face Aston Villa in Saturday's final. Chelsea Turnbull (Hilario 63); Ferreira, Rajkovic (Chalobah 76), Terry (c) (Ivanovic 63), Cole; Lampard (Mikel 63), Zhirkov (McEachran 61); Kalou, Benayoun, Malouda (Sturridge 61); Drogba (Torres 61).